Butter an 8 x 8 baking pan and set aside. Combine sugar, corn syrup, butter and one cup cream in a deep saucepan - more depth than surface area. Set over medium heat, stir constantly and bring to a boil. Stir in remaining cup of cream and vanilla extract. Place a candy thermometer in saucepan. Stir frequently as mixture begins to thicken and turn golden brown. Boil until mixture reaches 254 degrees. Remove from heat immediately - use caution as molten sugar burns - and transfer into prepared pan. Let stand until just warm. 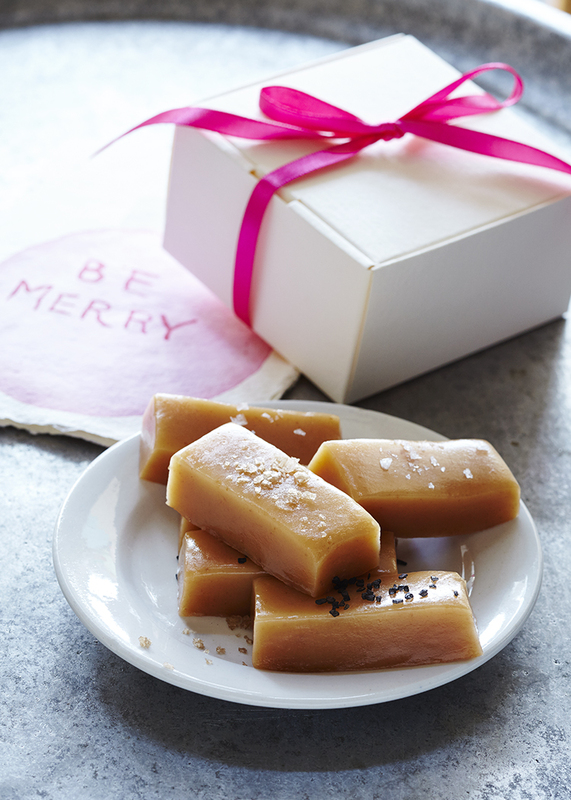 Sprinkle top of caramels with fancy sea salt - pressing down ever so gently so that salt adheres to caramel. Cool completely before cutting into squares and boxing up.